Well, who the hell is Richard Sliwa? Although I was born in England (in Birmingham,to be exact, on 9th June 1962 - work out my age from that! ), my parents are from Poland, and I was brought up to consider myself to be Polish. One thing I most certainly am NOT, is "English" (whatever that means!). As for "being proud to be British" (which some people say that I am), what on earth does that mean? it's nothing more than the formal citizenship I have, according to my passport. My birth certificate gives the Polish equivalents of my forenames, but after many problems with British officialdom (including my name being mis-spelt in my first passport! ), as soon as I was able to do so (at the age of 16) I formally adopted the English versions. I always felt particularly justified in taking that step, as Richard is very much an Anglo-Saxon name (it means "good king"). My surname, 'Sliwa', means 'plum' (actually, it means 'big plum', or 'plum tree'), hence the name of this site. If properly written, it has an "accent" above the "S". "Schliva" is pretty close to the way it should be pronounced, but if I'm asked it, I'll say it's "Sleever" (which is the way most English people pronounce it if they bother). I come from a large family and have five sisters and one brother. I'm the second-youngest and remain the only one not to have got hitched (or married, if you prefer). 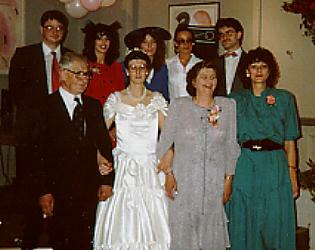 If you're curious, this picture was taken at my sister Barbara's wedding in 1990. This was the first time for many years that the whole family was in the same place at the same time, and regrettably, all I have left is the one snapshot, as all the other photgraphs have mysteriously gone missing. (Strangely, or not...) we've not all been together since that day, either, due to the fact that we're spread around the world. When I was eleven, the internationality of my background got a bit complicated. I was sent to a Polish school based in an Irish building in the Latin Quarter of Paris, France, which was funded to a large extent by sources in America. I was considered too clever (something which always baffled me) to join the first year, and was made to go straight to the second. As a result, I spent my entire education as the youngest pupil in the class, and so to make myself heard had to develop a loud voice. The fact that I am second-youngest in a large family helped as well... It is therefore not entirely without merit that one of the many nicknames I have had in my life was foghorn. A colleague in a previous job was fond of saying When you whisper, think you're in another man's bedroom [with his wife], not on stage. That nickname is one of many I've adopted online, although nowadays if I'm not using my real name, I appear as Plumski. Although the school was in the very centre of Paris, we were very much a closed community and opportunities to leave the school walls were limited. It was a VERY badly run establishment in terms of teaching staff and equipment, but it taught me the value of independence and seeking out things for myself. As a result, most of the things I've learned in my life have been despite my formal education, not thanks to it. One of the down sides to that is that ever since, I have very little patience with people who don't have a sense of curiosity and adventure. However (and this is particularly true of a lot of newcomers to the net community), I have even less patience with people who think they know everything there is to know and don't accept the possibility that others might know better. Having received my (worthless, as it turned out) high school diploma three days after my seventeenth birthday, I then to decide what to do next. After much soul-searching, I stayed on in Paris, where I studied Theology and Philosphy at the Sorbonne. This was in preparation for becoming a Roman Catholic priest. The fact that I am just a Mr, and not a Fr, is indication enough that I gave up on this particular idea. The reasons are very complex, and far too boring to go into here. For those who are curious, please feel free to ask. In any event, I came back to England in 1984, and after spending a few months with my parents recuperating and wondering what to do with my life, I eventually settled in London. While I was still studying, I became involved in a London-based political pressure group campaigning for human rights in Poland, called Solidarity with Solidarity (SwS), which was run by Tadek Jarski, the father of a schoolfriend. For want of something better to do, in September 1984 I came up (or down, depending on your point of view) to London to help out. Tadek put me up in his home (his son was of studying medicine; he's now a doctor) for a weekend, but three months later we realised that I was still living there! First I stayed with friends, and then, for the first time in my life, I got a taste of true independence when I set up home on my own. I was later joined in that apartment by a couple of other friends and we had some great times. As none of us were actually paid anything for our work, I had to find a part-time job to be able to feed myself, and I was offered a job at the law firm of one of our members, Irma Pietron (there'll be a link here when they finally get on-line), for whom I worked for seven happy years until 1993. Our parting was quite amicable, and I'm still in touch with them, and even get asked to tinker with their 'pooter occasionally. When I left, I spent six months spending what money I had travelling around and relaxing. When the coffers ran dry, I had to find a job, and ended up running the office of another organisation dealing with things Polish, this time a charity, called Medical Aid for Poland Fund. 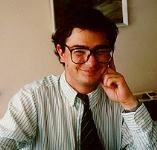 In November 1996, following various changes in the way the origanisation was run and new ways to meet its objectives, the sad deaths of two of the most important people within the Charity, and the resignation on health grounds of yet another, it was decided that the post I held would disappear and so on 31st December 1996, once again I found myself out of work. Maintaining myself from savings and a few odd things here and there, I put my energies into the creation and maintenance with Dave Wythe of the largest Star Trek site on the World Wide Web. It's always taken up far more of our time, energy (and money!) than either of us ever envisaged, but the results have probably been worth it. A question I often ask myself is who is more sad: Dave and me, for creating such huge amounts of material, or the 3,000 people who come along every day to download it all? :-) We both spend less time working on the site nowadays, and three servers later, we seem to have found our home at Positive Internet. Since then, I've tried to eek a living doing various odd jobs, but right now I'm looking for a full-time job, so if anyone has a post for an internet-savvy, polyglot philosophical Trek fan, please feel free to contact me. Something which took up virtually all of my time between February 1998 and Septmber 2000 was another campaigning function, this time the Campaign for Unmetered Telecommunications. I won't go into that issue in depth here - you can find out all you want from the CUT site. One of the things I've learned has been that people everywhere, and perhaps especially in Britain, are utterly unaware of the facilities available to them to allow their voice to be heard or how to go about defending the rights which the generations before us have fought to obtain. We sit in our sofas in front of the TV like cabbages and mutter among ourselves that this or that is wrong but rarely get off our backsides to do anything about it. One of the significant drawbacks to all of this is that I'm cooped up at home pretty much 24/7 and have no opportunities for a real-world social life. Without the internet, I'd probably have gone mad (or at least, madder) by now. Also, I get little opportunity for conversation - it is not unknown for me to go 3 or 4 days without speaking a word of English out loud (I speak Polish with my parents). And my online communications tend to be very talkative because, well... it's the only opportunity I have to converse.